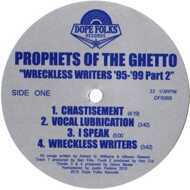 Our 69th release is from Philly's PROPHETS OF THE GHETTO! This is the 2nd volume in the WRECKLESS WRITERS series (Part one is long gone). 7 Tracks from the '95-'99 era!